Two extant species have been described in this genus: Paracupes brasiliensis Kolbe, 1898 occurs in the provinces Bahia, Minas Gerais and Parana in the southwest of Brazil (South America). 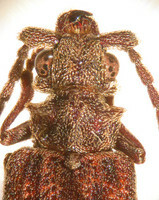 Paracupes ascius Neboiss, 1989 is only known from its type locality in central Ecuador (South America). The only known fossil species is Paracupes svitkoi Lubkin, 2003 from the Cretaceous of New Jersey. Both extant species are very similar in body shape and coloration. Specimens of P. brasiliensis can be between 6 and 16 mm long. 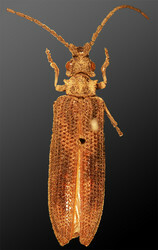 The holotype of P. ascius, which is the only known specimen, is 10.4 mm long and 3 mm wide. Paracupes is easily identified by the characteristic small and strongly anteriorly inclined head tubercles above the antennal insertions. Median and posterior head tubercles, which are so prominent in Cupes capitatus and some other Cupedidae, are absent. The body is long and slender, with parallel sides. The pronotum is comparatively small with prominent anterior corners. In cross-section the body is semicircular, which is uncommon in Cupedidae or Archostemata and similarly found only in Priacma serrata. According to Hörnschemeyer (2009) Paracupes is the sistergroup of Priacma. This interpretation is based mainly on head and mouthpart characters. For instance, the shape and size of the mandible are very similar in both genera. However, these similarities could also be interpreted as plesiomorphies of Cupedidae. In this case, support for a sistergroup relationship of Paracupes and Priacma would be quite weak, suggesting that these species are just "primitive" representatives of Cupedidae. Gestro, R. 1910. Cupesidae, Paussidae. Coleopterorum Catalogus. Vol. 4 Pars 5. Kolbe, H. J. 1898. Eine neue Gattung der Cupesiden. Entomologische Nachrichten 12: 179-180. Lubkin, S. H. 2003. Paracupes svitkoi (Coleoptera: Cupedidae), a new species from the Cretaceous of New Jersey. Acta Zoologica Cracoviensia 46:189-194. Neboiss, A. 1989. New species of Archostemata (Coleoptera, Ommatidae, Cupedidae). Revue francaise Entomologie (N.S.). 11(3): 109-115. Vulcano, M.A. & Pereira, F.S. 1975. 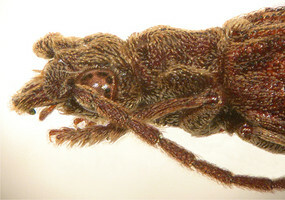 Cupesidae (Coleoptera). Archivos do Instituto Biologico, Sao Paulo, Brasil 42: 31-68. Page: Tree of Life Paracupes Kolbe 1898. Authored by Thomas Hörnschemeyer. The TEXT of this page is licensed under the Creative Commons Attribution-NonCommercial License - Version 3.0. Note that images and other media featured on this page are each governed by their own license, and they may or may not be available for reuse. Click on an image or a media link to access the media data window, which provides the relevant licensing information. For the general terms and conditions of ToL material reuse and redistribution, please see the Tree of Life Copyright Policies.